Mixed martial arts is a volatile sport, which can make for some difficult prognostication. Not only is it a competition of individuals competing on an infrequent basis, but the slightest mistake at the elite levels of UFC competition can lead to a stunning finish, no matter the theoretical expectation of outcome or fighter performance in a fight up until the point of its conclusion. An underdog's opportunity for victory may be rare and fleeting, but history keeps reminding us that anything can happen on fight night. 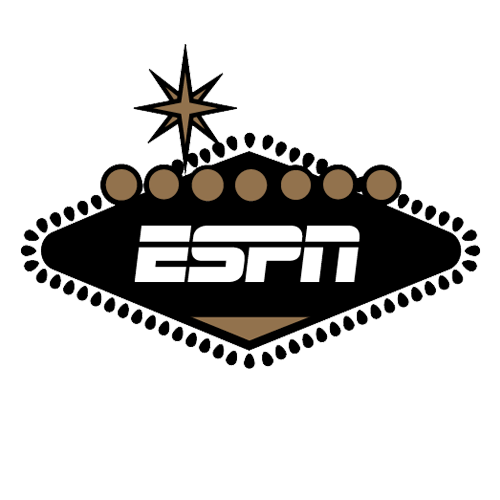 This dynamic is in stark contrast to many other sports, where it's unlikely for an underdog baseball or football team to post an unexpected and lopsided scoring rout of a strongly favored opponent. That's thanks to the stability team sports provide against an individual outlier, and the repeatability and improved predictability of seasons with many games. But in MMA we continuously see underdogs excel in violent fashion, even under the brightest lights of championship bouts. Sometimes it's an ephemeral but fortuitous opportunity boldly seized upon, and sometimes it's an individual's inadequacy due to injury, fatigue or mental lapse that opens the door to upsets. TJ Dillashaw gets the award for the most improbable upset, based on his closing odds of +710 against then-champion Renan Barao. Holly Holm would have had a chance to shatter that record in her upset win over Ronda Rousey, but late-market action pushed her price from a peak of +1250 down to just +525 at fight time. While the late trend was sharp for Holm, it's interesting that Frankie Edgar was an underdog to BJ Penn in their rematch, even after defeating him by unanimous decision in the first bout (Edgar would go on to do so again in their second fight). 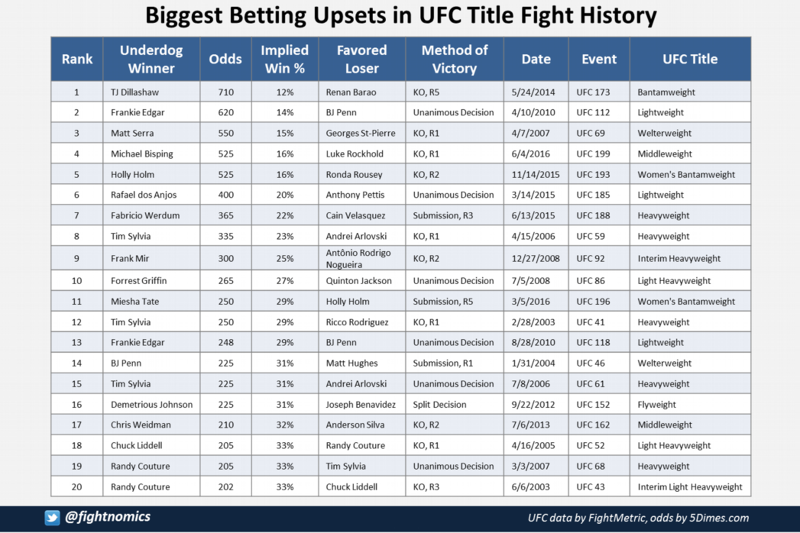 Meanwhile, Tim Sylvia, Randy Couture and Chuck Liddell appear numerous times on this list, falling on both sides of the favorite/underdog column for their fights that took place during the early boom years of the UFC. The finish rate of these upsets is above the norm, as well, making up 70 percent of the results in the top 10 and 65 percent in the top 20. By comparison, the overall modern finish rate sits around 50 percent. The conclusion, then, is that these upsets were less often squeaked out on scoring cards and more often finished in violent and emphatic fashion. Interestingly, markets seem to be just as volatile now as they were when the sport was still evolving. Chris Weidman's stunning knockout of Anderson Silva in 2013 was an early indicator of a new era of title fight upsets as the title pictures at middleweight, heavyweight and women's bantamweight have become veritable revolving doors. 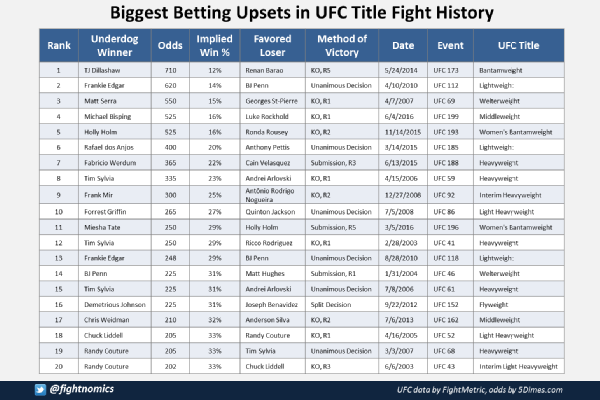 Five of the 11 biggest upsets have occurred since 2015, four of which came by knockout or submission, and four of these upsets were secured by a current reigning champion: Michael Bisping, Rafael dos Anjos, Miesha Tate and Demetrious Johnson. With five UFC titles on the line during International Fight Week, it's not unreasonable to expect the unexpected to happen once again.